I have a picky eater at home. Do you? One time she told me, “everybody has stuff they don’t like, Mom.” What a little sassy pants! But she’s right. We all have certain things that we don’t like and I’m okay with that. What bothers me is when she refuses to try something new or when she refuses to eat something that she previously liked, just because she’s not in the mood to eat dinner. It also really bothers me when she tells me “I’m just not hungry. Can I have dessert?” No, you cannot have dessert!! The biggest “picky eater” myth I’ve heard so far is that they’ll eat if you let them pick it out or if you let them help prepare it. My daughter loves helping in the kitchen. She will pull over a chair to stand in and she will watch and help to her little heart’s content, but she still won’t eat it if she doesn’t want to. The best advice I’ve ever heard is this: It is a parent’s responsibility to provide healthy meals. It is the child’s responsibility to eat it. And, kids will not starve with food in front of them. With those two pearls of wisdom, I offer the best meals I can and I let it go if she doesn’t want to eat… But it is still frustrating when I take the time to plan, shop for, and prepare a meal that is going to go into the trash at bedtime, so I do try to plan meals I know everyone will enjoy. My very sweet neighbor gave me a “Kid Approved” cookbook and I have tried two recipes from it. One was a huge hit, the other wasn’t. BUT it gave me a great idea. There are certain foods that all kids love, but we don’t like preparing often because they are so highly processed and not at all healthy. What if we could make some of these things healthier by making them from scratch- or mostly from scratch? The recipe that was a hit was homemade, oven baked fish sticks. 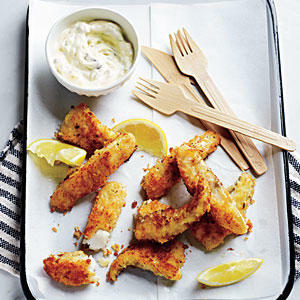 Instead of pressed fish parts that have been fried and flash frozen, this recipe used whole fish filets that you cut into smaller pieces before coating in breadcrumbs and baking. The fish was dressed up a little with some lemon zest and it was delicious! Amelia loved it, and so did my husband and I. So that got me thinking: What other highly processed foods, that are loved by children everywhere, could I make more healthy at home? I asked some friends “Imagine you’re walking down the frozen foods aisle at the grocery store. What do your kids ask for?” Here were their responses: pizza bites, chicken strips, individual frozen pizzas, ice cream sandwiches and Popsicles. Cut the cod filets into 1-2 inch strips. Season fish on both sides with salt and pepper. Place flour in one bowl, egg in one bowl and mix bread crumbs, parm and lemon zest in a third bowl. Dredge fish pieces in flour, then coat in egg. Next coat in the bread crumb mixture and place on a prepared baking sheet. Spray fish with cooking spray and baked at 450 for 8-10 minutes. 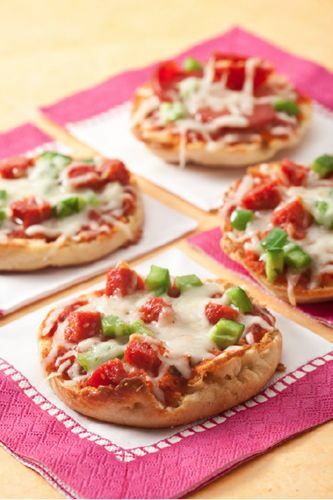 Kids love mini pizzas. Make them healthier than the “frozen foods” version by building them on a whole-grain English muffin. Simply top the English muffin with a store bought pizza sauce, chopped vegetables and some mozzarella cheese made from skim milk.. These can be done in pretty much the same way the fish was done. You can buy chicken breast already cut into strips, or you could buy chicken breasts and cut them yourself. Coat them in the flour, egg, and breadcrumbs (seasoned any way you like) and spray with cooking spray, then bake. With the chicken, go with a 450 degree oven for 12-15 minutes. Use a meat thermometer to check that the internal temperature of the chicken is 165 degrees before serving. This will insure the safety of the chicken. Throw all ingredients in a blender and puree til smooth. Pour into popcicle molds or small plastic cups. Freeze for an hour, then insert popcicle sticks and put back in the freezer til frozen through. ** This could work with any fruit your kids like! DirectionsPreheat the oven to 375 degrees F.In a mixer, combine the brown sugar, white sugar, butter and margarine until combined. Add the vanilla and eggs, and stir together.